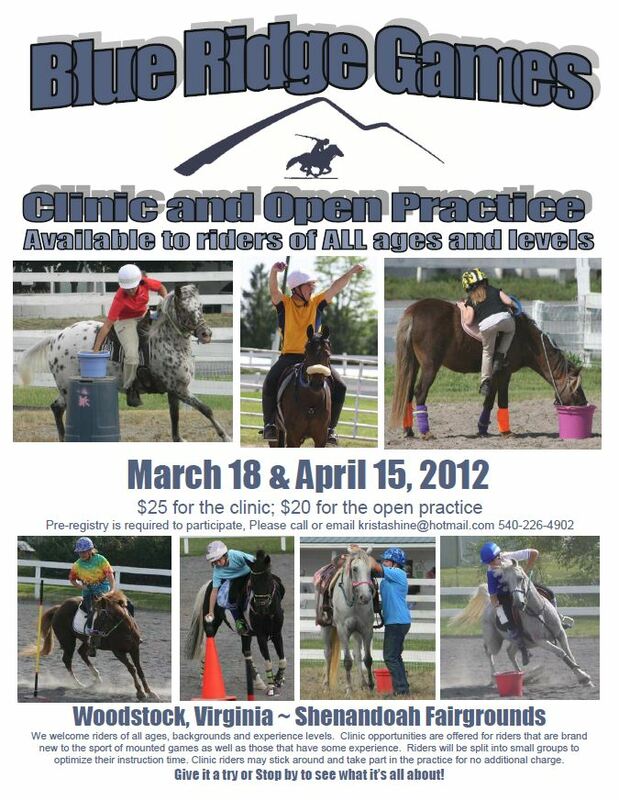 I have been working on the PR for our Blue Ridge Games Clinic and Open Practice sessions that are coming up. I made up this flyer to post all over the place. I think it came out pretty good. We are offering clinics that are open to riders that are brand new to games as well as those that are already playing but want to advance their skills some. It would be great for any Pony Club games riders that are gearing up for their regional or the national competitions or that want to start playing MGAA games this year. Riders will be grouped by skill and experience to best optimize their time. Its only $25 and riders may also stick around and take part in the open practice for no additional charge. The practice is open to anyone. We bring the equipment, and mark out an A and C line and everyone can dive in and have fun. It’s a great opportunity to brush up for the spring season, and get the bugs worked out of your pony. It is also a fabulous way to get a new pony out and experienced before going to a competition. Practice is $20 a rider. We are doing these at the Shenandoah Fairgrounds in Woodstock, Virginia. Everyone must register in advance. We ride in a ring on all weather footing, but will cancel if the weather stinks. We have a website – which is still under construction – www.blueridgegames.org and we also have a facebook page www.facebook.com/blueridgegames that you can “like” if you want updates.